The remastering path for 'Robot' was completely standard - the D3 digital videotape copy of the original quad transmission master was Transform Decoded onto Digital Betacam and was graded by Jonathan Wood and cleaned up in the usual manner. The video levels and grading were generally good, without the usual varying amount of lift on the signal (sometimes anywhere up to 10%) producing milky blacks. However, there was a general feeling that the gamma response was a little bit too low at times producing a slightly gloomy picture, mainly on the early scenes with the new Doctor and the Brigadier. So some gamma stretch was applied to brighten things up without reducing the solidity of the original. With the external video scenes, a fair amount of re-balancing was required, removing a slightly green bias and offsetting problems with flare and chroma smear across bright objects causing some hue changes on panning shots. On the audio side of things, Mark Ayres found things less problematic than usual too. A general clean up, noise-reduction and de-click operation was carried out, with dropouts manually repaired and edits cleaned up. Some radio mic interference on the Robot voice was removed as much as possible. The beginnings of episodes three and four were direct VT play-ins from the end of the previous episodes, so these sections were remade to save a generation and reduce hiss problems. Unusually for stories made in this era, the location sequences were all shot on video cameras. This was a decision by producer Barry Letts to try to get better integration between foreground and background images in composite CSO shots, something which he felt was a problem on previous shows where he had used a mix of film and video. The videotapes were generally in good condition, although external shots exhibited a lot of chunky dropout (cf. 'The Sontaran Experiment') probably characteristic of the mobile recording equipment. Standard manual de-blobbing was done to remove dropouts and fix some slight VT off-locks on edits. A white spot due to a tube camera defect was visible on many shots, especially outside. This was concealed as best as possible by using an auto-rotoscoping tool to fill in from surrounding pixels. In episode two, there is a speeded-up videodisk shot of the Doctor typing a letter for Sarah, which was unpicked and retimed to lose the jagged, filmised look as much as possible. The videodisk shot of the tank at end of episode three was also retimed to give slightly smoother movement (although, as this was a model pulled on wire, it's still a bit jerky). We did look into replacing this infamous 'Action Man tank' shot with either CG or a new model, but the budget for both proved prohibitive - as did the possibility of replacing some of the CSO model robot work in the last episode with a CG model. However, lots of minor tweaks were made to CSO shots in that episode to fill in some holes caused by the robot's metallic body reflecting the key colour. The aim was to retain the look and character of the raw effect, while making it less distracting and laughable - it now looks like "ok CSO" rather than "bad CSO". 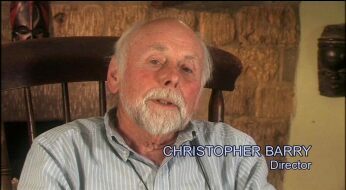 The story features a commentary by Tom Baker, Elisabeth Sladen, producer Barry Letts and writer Terrance Dicks. 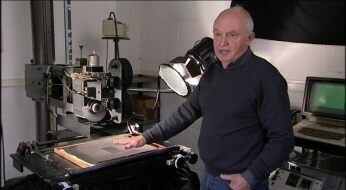 Andrew Beech produced the main documentary, Are Friends Electric? (dur. 38' 58") , which looks at Tom Baker's introduction as the Doctor and the making of his first story. 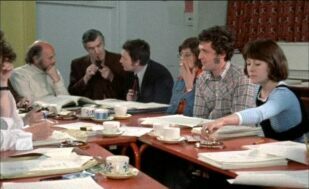 It features interviews with actors Tom Baker, Elisabeth Sladen, Alec Linstead, Patricia Maynard, Michael Kilgarriff and Edward Burnham, producers Barry Letts and Philip Hinchcliffe, script editor Terrance Dicks, director Christopher Barry and production unit manager George Gallacio. New RT producer Brendan Sheppard, an experienced BBC director, contributes his first feature for us, The Tunnel Effect (dur. 13' 47"), in which graphic designer Bernard Lodge explains how he created the complex 'never-ending tunnel' opening titles for Tom Baker's stories. Watch out for more features from Brendan on forthcoming discs! Also included is the opening sequence of an episode of the children's magazine programme, Blue Peter, which was forced to transmit from the 'Robot' studio set due to industrial action. As usual there is a photo gallery, production subtitle notes and Radio Times listings in pdf format. Copyright Steve Roberts, 1 March 2007. No reproduction allowed without written permission.